* Originally published at Cinética in April 2009. In the opening shot of Moscow (Moscou, 2009), an actor wearing a t-shirt of the theater group Galpão holds a photograph of a park and tells the camera about the first time he spent his vacation in Moscow. His most vivid memory is that a film theater was being destroyed when he arrived at the square. According to him, the recollection of the destroyed cinema was more heartbreaking than the demolition of his own house. It is revealing that this specific shot became the prologue of the film because the destruction of a cinema is, indeed, the origin of Moscow. For with every new film it becomes clearer that there’s something Shivaesque about Eduardo Coutinho: every time we feel it’s possible to frame his cinema within boundaries he himself has helped set up (Coutinho’s famous “rules of the game”), these walls are torn down to make space for a new film which, in turn, reshapes the viewer’s relation with Coutinho’s entire body of work. Babilônia 2000 (Babylon 2000, 2000) revisited the slums as a scenic space, but with intentions distinct from those in Santa Marta, Duas Semanas no Morro (Santa Marta: Two Weeks in the Hillside Slums, 1987) and Santo Forte (The Mighty Spirit, 1999); Edifício Master (Master Building, 2002) destroyed the veneer of ethnographic purity and approached the Rio de Janeiro middle class through expressive voids (the alternation between faces and hallways, for example); Peões (Metalworkers, 2004) traded the search for diversity in the commons for a same historical axis that connected distinct lives, radically inverting Coutinho’s previous vantage point; O Fim e o Princípio (The Beginning and the End, 2006) – a title that synthesizes the director’s restless soul – looked for stories that hadn’t been told, while Jogo de Cena (Playing, 2007) told the same stories more than once. The one constant mark in the cinema of Eduardo Coutinho is that with every new film one is forced to rethink all that’s come before. If his conversations strive for the irreducible, it’s because they mirror his own behavior: Coutinho doesn’t let himself get caught. Writing about his films is like mumbling a thought haunted by its own insufficiency. It is no surprise, then, that just when his gaze begins to seem decodable, Moscow comes to question everything we thought we knew about him. Eduardo Coutinho – the filmmaker of rules, the watcher of transparency, the systematic designer of medium-shots, the caretaker of the words – arrives at Moscow without any luggage. What is shared between this film and his previous work is a common attitude: one must be faithful to the honesty of an encounter. But we don’t know Moscow (with and without italics), therefore we cannot interpret anything about it fully. What we know are ideas of Moscow; a scene, a memory, a dream, a verse – meanings created at a distance, but that grow richer precisely for being endlessly mediated. To each their own Moscow. The camera floats with the zoom, and the focus racks try to hold a meaning that escapes them. Coutinho’s habitually dry voice-over vibrates with a reverb that evokes the spacious theater we are looking at, as well as a divine omnipotence. Either way, one concrete certainty remains: his voice reverberates, and this reverberation is always pointing at something that lies outside the semantics of the words. The meaning generated by the effect might be hard to pinpoint, but one cannot shake the feeling that a very strong meaning is being produced. The starting point is a play by Anton Chekhov, played by actors who are directed by an external metteur-en-scène (Enrique Diaz). We won’t get a full adaptation of The Three Sisters, and Coutinho lets the audience knows that from the get-go. What we do get are scenes, small fragments of drama, but a drama that is always there to underscore the rarefaction of meaning. The film is not the making of a theater play because Coutinho is not interested in the creation of meaning itself, but in the meanings that have already been produced and are brought in by each individual, and which remain only partially accessible. The excerpts of the character-development workshops directed by Enrique Diaz are sparse and don’t clarify much: whether an actor borrows someone else’s personal memory during a table read or interacts with the photographs stapled to their costumes, what we have are signs en abyme that allude to a process we cannot fully understand. Meaning is produced from something that remains outside the film, therefore it’s useless to try to map them out. The motivation belongs to someone else. How did we go from Russia to Divinópolis? How has masking tape become a noble gift? The motivations are the off-screen space; what is left are signs that are fully fleshed out in their polysemy, undecipherable yet whole, revealed in their unique mystery – a characteristic Moscow shares with João César Monteiro (especially Le Bassin de J.W., 1997) as well as Straub & Huillet. What is Moscow after all? It is a city we never get to see, but also a dream, a desire, a memory, a door drawn with chalk on a black wall. It is the escape to a place that lies beyond, and which shall remain beyond, for it is unknown. But first and foremost Moscow is the very act of drawing a door with white chalk on a black wall – black and not white, for black is both the absence and the wholeness of color, a fullness one finds in a shot where the actors are framed through a window, talking over each other, pushing the multiplicity of meanings to a level of absolute disorientation. It is not exactly a door, but the indication of the sign “door” – recognizable enough to trigger all kinds of associations, like one letter in a name pulls an adjective, and one memory brings another. It is a door that’s been drawn behind a bar – a bar that allows the imaginary door to open to the outside (but not to the inside, like the door of a home normally does), but that keeps you from going through it. It is a photograph that, although still and clear, acquires endless meanings through the eyes of the actor: the three sisters become three brothers, who become Huey, Dewey, and Louie, all of that in a tight shot which is disturbed by a violent zoom-out, whose borders reinforces the shot’s limit at the same time that they point outwards. Moscow starts with Chekhov, passes by Proust, and arrives at Joyce. 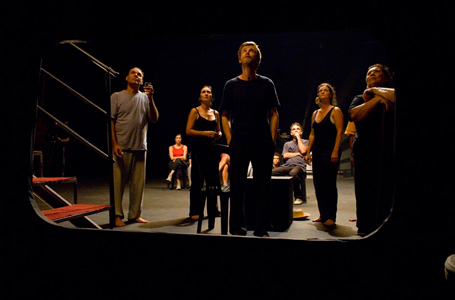 In one shot, the actors hum the melody of “Como Vai Você,” one of Roberto Carlos’ most famous songs, using lighters as percussion; a breath later, a shot shows actors actually singing the song in the dark, with their faces only briefly lit – and never bright enough to be identifiable – by matches (or is it still lighters?). The scene exposes the associative process that generates meaning (the same song, the same fire, but in different representations that are like links on a chain) as well as establishes a connection with the viewer, teaching them how the film should be watched. In Moscow Coutinho leads us to the dark, and gives us only fleeting glimpses of direction we can desperately cling to. But we can also surrender to the endless possibilities of this darkness – one that has the ability to merge with the darkness of the theater. In both cases, what stands is the fact of a song, a rhythm, a melody that, albeit deeply familiar, evokes a different set of feelings to each ear. * Publicado originalmente em Cinética em Abril de 2009. No primeiro plano de Moscou, um ator vestindo a camiseta do grupo Galpão segura a foto de uma praça, e conta à câmera sobre a primeira vez que passou férias em Moscou. Sua maior lembrança é a de que um cinema estava sendo destruído quando chegou à praça. Segundo ele, a evocação do cinema destruído era mais devastadora do que a da demolição de sua própria casa. É revelador que esse plano seja o prólogo, pois a destruição de um cinema é, de fato, a nascente de Moscou. Pois, a cada novo filme, Eduardo Coutinho mostra ter algo de Shiva: sempre que acreditamos ser possível enquadrar seu cinema dentro de limites que ele faz questão de definir com clareza (as famosas “regras do jogo”), essas paredes são derrubadas para que se possa construir um novo filme que, por sua vez, transformará a relação com toda a obra de Coutinho. Babilônia 2000 voltava à favela como espaço, mas com intenções muito distantes das de Duas Semanas no Morro e Santo Forte; Edifício Master implodia a aparência de pureza, se aproximando da classe média construindo vazios com absoluta consciência (a alternância entre rostos e corredores, por exemplo); Peões deixava de buscar a multiplicidade no comum, e ia de encontro ao elo histórico que conectava vidas tão distintas, invertendo radicalmente seu eixo produtivo corrente; O Fim e o Princípio – título que sintetiza muito precisamente esse espírito inquieto – ia em busca de histórias não contadas, enquanto Jogo de Cena contava as mesmas histórias diversas vezes. Daí a suposta reinvenção de Jogo de Cena ser tão furada: se há uma constante no cinema de Eduardo Coutinho, é que a cada novo filme somos motivados a repensar todos os anteriores. Se suas conversas buscam o irredutível, é assim que Coutinho se porta em sua própria carreira: ele não se deixa pegar, e escrever sobre seus filmes é balbuciar um pensamento condenado à insuficiência. Não é surpresa nenhuma então que, quando o foco de seu olhar começa a parecer decodificável, venha Moscou para derrubar quase tudo que acreditávamos saber sobre ele. Eduardo Coutinho – cineasta das regras, bastião da transparência, metódico dos planos médios, zelador da palavra – chega a Moscou sem bagagem alguma. De comum a todos os seus outros filmes, uma atitude realizadora: ser fiel à honestidade de um encontro. Mas não conhecemos Moscou (com e sem itálico), e por isso não conseguiremos interpretar nada plenamente. O que conhecemos são idéias de Moscou; uma interpretação, uma lembrança, um sonho, um verso – sentidos produzidos à distância, mas que se tornam mais ricos justamente por serem infinitamente mediados. Cada um tem sua própria Moscou. A câmera se entrega à zoom e às passagens de foco que tentam apreender um sentido que sempre nos escapa. A voz em off de Coutinho, sempre tão seca em seus filmes anteriores, aqui vibra com o reverb que pode tanto evocar o teatro que vemos em cena, quanto uma certa onipotência divina. Há uma certeza concreta, porém: sua voz reverbera, e essa reverberação aponta sempre a algo exterior à semântica das palavras. O sentido que esse efeito produz é imprecisável, mas não se contorna a sensação de que um sentido muito forte está sendo produzido. O ponto de partida é um texto de Chekhov, interpretado por atores que são dirigidos por um outro realizador (Enrique Diaz). Não teremos uma encenação completa de As Três Irmãs, e Coutinho avisa isso logo no início do filme. O que temos são cenas, pequenos fragmentos de dramaturgia, mas de uma dramaturgia que chama sempre atenção para sua rarefação de sentidos. Não é o making ofde uma peça teatral, pois Coutinho não se interessa pela produção de sentidos em si, mas sim pelos sentidos já produzidos – e esses sentidos são apenas parcialmente apreensíveis. Os trechos dos laboratórios promovidos por Enrique Diaz para a construção das personagens são raros, e não esclarecem coisa alguma: desde o roubo das memórias alheias na mesa de leitura, às fotos pregadas às roupas dos atores, o que temos são signos abismáticos que apontam para uma construção que não compreendemos totalmente. O sentido é produzido a partir de algo que também está fora do filme, e é inútil tentar mapeá-los, pois nunca conheceremos a motivação do outro. Por que sair da Rússia e chegar em Divinópolis? Ou ofertar rolos de fita crepe como presente? As motivações são o extracampo, e o que sobra é o signo pronto, polissêmico, indecifrável, mas uno por ser revelado em seu mistério – algo que aproxima Moscou tanto de João César Monteiro (A Bacia de J.W., principalmente), quanto de Straub e Huillet. Pois, o que é Moscou? É uma cidade que nunca vemos, mas também um sonho, um desejo, uma lembrança, uma porta riscada em uma parede. A fuga para algo que está fora, e que permanecerá fora, pois é desconhecido. Mas, sobretudo, o ato de riscar com giz as linhas de uma porta em uma parede preta – preta e não branca, pois o preto é tanto a ausência quanto a plenitude absoluta da cor; como, em outro plano, os atores aparecem enquadrados em uma janela, falando todos ao mesmo tempo, levando a multiplicidade de sentidos a um nível de desorientação absoluta. Não exatamente uma porta, mas sim o signo “porta” – mínimo necessário para que as associações entrem em curso, como uma letra de um nome puxa um adjetivo, e uma memória puxa outra. Uma porta riscada atrás de uma barra – barra que permite que a porta se abra pra fora (mas não para dentro, como tradicionalmente são as portas das casas), mas que impede que se passe por ela. Uma foto, estática e cristalina, mas que, pelos olhos do ator, ganha sentidos infinitos: as três irmãs viram três irmãos, que logo viram Huguinho, Zezinho e Luizinho. Isso tudo em um plano fechado que, com um chicote de zoom, logo é arejado para seu entorno, em um escopo que reforça seus limites apontando sempre para fora. Moscou parte de Chekhov, passa por Proust e chega a Joyce. Por isso, em um plano vemos os atores murmurarem a melodia de “Como Vai Você”, canção imortal de Roberto Carlos, usando isqueiros de forma quase percussiva; para, logo depois, vermos atores cantando de fato a canção, no escuro, tendo seus rostos brevemente iluminados – mas nunca o suficiente para serem identificáveis – pelo riscar de fósforos (ou serão ainda os isqueiros?). A cena não só mostra o processo associativo da produção dos sentidos (a mesma canção, o mesmo fogo – mas em representações diferentes que parecem se encadear), como constrói a relação que o filme estabelece com o espectador. Pois, em Moscou, Coutinho nos leva para o escuro, nos dando apenas brevíssimos momentos de vidência aos quais podemos desesperadamente tentar nos agarrar. Mas podemos, também, nos entregarmos às infinitas possibilidades daquela escuridão – capaz de se amalgamar com a da própria sala de cinema. Em ambos os casos, o que se impõe é uma canção, um ritmo, uma melodia que, embora absolutamente familiar, evoca a cada ouvido um conjunto de sensações diferente, único, intransferível.